Join the discussion on our forums! 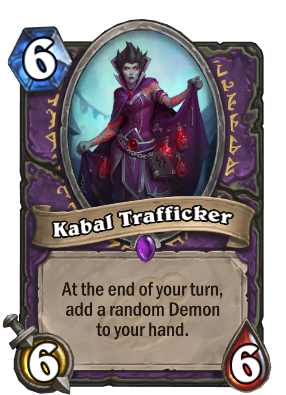 Come discuss Kabal Trafficker over in our dedicated Kabal Trafficker discussion topic. I used to think that this card was fun (and not too risky) to run with Krul the Unshackled. But then I got greedy and tried to double my output with Drakkari Enchanter and then rub it in with Bloodreaver Gul'dan. Initially it seemed promising, but then I gave up after one game where I got 2x Unlicensed Apothecary one turn and then other Unlicensed Apothecary plus a Howlfiend on the next turn, making Krul and Bloodreaver unplayable that game. I'm guessing maybe it was because animating the cloth on her jacket would be too difficult? one of the downsides is that this is NOT a demon therefore in standard this card is kind of average for being a 6 drop in a warlock deck. if this were a demon in WILD I think it would be played in every demon zoon deck. Throw in barnes and hit this on turn 4 and get a demon at end of turn? crazy ! Wait? Funnel Cakes in the flavor text?! This is groundbreaking evidence! drops this, Gul'dan be like: " pleasant feast of winter veil..."
gets Lord Jaraxxus, me starts singing "you face Jaraxxus, you face Jaraxxus, EREDAR LORD OF THE BURNING LEGION, JARAXXUS, JARAXXUS, you face JARAXXUS...."
turn 9 : "I will feast on your soul this winter veil, MUHUHAHAHAHA"
This card looks really strong, it's ok even if you only get one trigger (and you will get one of course because it happens at the end of your turn). Barnes in a Reno deck could actually be very interesting. If you use a Youthful Brewmaster on whatever he pulls out it allows a 'duplicate' without screwing up your Reno Jackson, Kazakus, or Krul the Unshackled. Other potential cards to draw would be Voidcaller, Mal'Ganis if you have a board, Imp Gang Boss, Sylvanas, Ysera, Weasel, Mistress of Mixtures and Mistress of Pain. Maybe some will even run Floating Watcher or Illidan - although after Abyssal Enforcer that seems unlikely. this card would give us so much fun! Please, please, let it be Mal'Ganis!